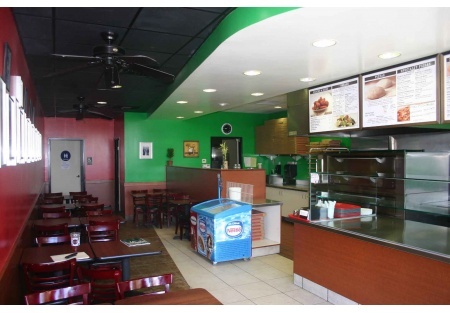 Outstanding opportunity to own a super popular pizza restaurant in the heart of an upper middle class neighborhood. This place literally overlooks one of the biggest most affluent high schools in San Diego. Signage gives unbelievable visibility, you simply can not drive through this area and not see the sign! The Pizza business for sale is built out in dark woods with a classy New York Style décor scheme. Bring your pizza or restaurant experience to this super busy location and be ready to rock! This place is turn key and simply needs an owner willing to work it and maximize the potential. The kitchen is ready for any and all of you menu ideas. Location features two seperate hood systems. You can continue as the current concept or expand to a more upscale full service concept, it's up to you. This place has the capability to handle it all. Owner states gross sales of approximately 40-45k per month and annual net income in the 90-100k range. Buyer should always independently verify all sales and income figures as broker does not verify this information. This space has huge potential for growth with a few minor modifications. Already a local favorite, add a beer and wine license and nice patio dining and sales could skyrocket. Space is a very manageable 1365 square feet inside and has access to 800 square feet of potential outside dinning area. Current lease expires in Sept of 2011 with two five year options available. Rent is right at 10% of sales at $4199 per month and CAM of $1160. Here is your opportunity to buy into one of the easiest and most profitable restaurant concepts available. Don’t miss this great opportunity. All you've got to do next is drive out to the locaiton and take a look. To do that, all you need is to become a member of SellingRestaurants. It's free and it opens the doors to special priviledges such as name and location of the business, preview of new listings, on-line confidential agreements, newsletters, etc.This is a Stone Path Brokerage Services, Inc. DBA Selling Restaurants San Diego listing.